Exploring Tokyo can be exhausting. Fortunately, numerous hip cafés and bars provide the perfect place to recharge batteries, while indulging in a spot of people watching. Some of the best can be stumbled across by simply wandering into the maze of tiny streets that lies off both sides of Omotesando. Take a stroll down Cat Street, past stylish fashion and design boutiques, before joining local hipsters over lunch at the the Bape Café (3-27-22 Jingumae), set up by the DJ designer behind cult Japanese label A Bathing Ape. Head towards the Prada building north of Omotesando and tuck into a virtuous herb tea and grain salad at the Pure Café (5-5-21 Minami-Aoyama), a serene eco-haven attached to the Aveda spa. Meanwhile, on the other side of Omotesando is the recently renovated Kurkuu (2-18-21 Jingumae), a sleek wood and glass architect-designed haven for style-conscious eco-lovers, complete with organic café, restaurant, bar and workshop. Art lovers should walk five minutes down the road to the hip basement café in the Mario Botta-designed Watari-Um Museum of Contemporary Art (3-7-6 Jingumae), checking out the current exhibition and its classy shop en route. A short stroll away – just next to exit three of Gaienmae metro station - is Sign (Yamakazi Building, 2-7-18 Kita-Aoyama), a vibrant cafe with bright graphic murals that attracts creatives by day and is home to a DJ and cocktail-sipping crowd by night. 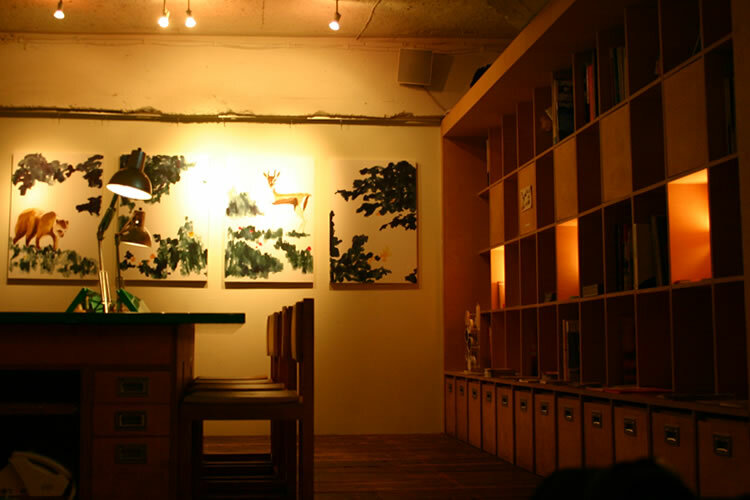 Those with quirkier tastes might wish to visit Office (Kita-Aoyama 2-7-18 Yamazaki Bridge 5F), a DJ bar decorated in the style of a conventional workplace, complete with filing cabinets, photocopying machine and bookshelves. How about this floating bar on the Sumidagawa. You can get the bar on a boat from Hinode pier near Hamamatsu Station on the Yamamote Line next to Shimbashi. The boat leaves every 30 minutes. You can stay on the boat for 3 hours or get off when it gets back to the pier every hour. The cruise can be a great night depending on howmany people there are on board. It's probably better to go with a few people just in case there aren't many punters on board the bar boat. They normally have a disco on board or special entertainment laid on on special days. If you decide to go on the booze cruise, come back and let us know about your experiences.